Learning new things about agriculture is one of the main goals of Purdue Ag Week, and the ag students are doing a great job of educating their peers about all areas of agriculture. One way they are doing this is by daily agriculture quizzes. Each day members of the Ag Week Task Force have been giving away prizes when students take a quiz about agriculture. This year, they are having students take the quiz (which features different questions each day) on their phones so they can better record the scores. Once students are done with the quiz, a Task Force member will hand them an answer sheet and go over the answers with them, along with a fun prize! In addition to the daily ag quizzes there have been some awesome events so far, with even more in store for Thursday and Friday. 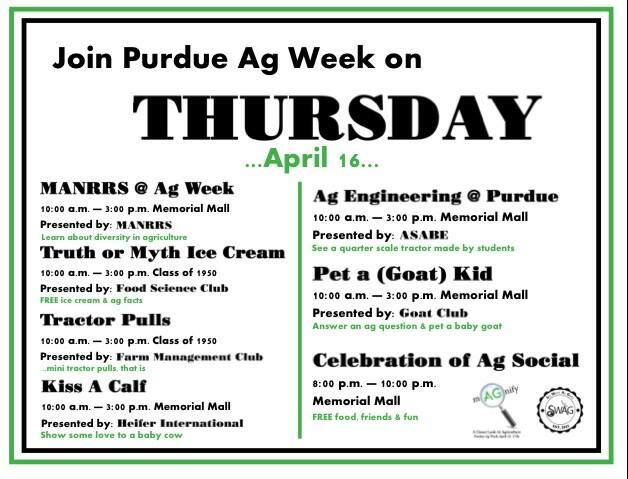 Thursday is the ever-popular “Pet A (Goat) Kid” event, along with a diversity in agriculture session from the MANNRS Club, a “Truth or Myth” Ice Cream session from the Food Science Club, mini tractor pulls and various other club events throughout Memorial Mall. 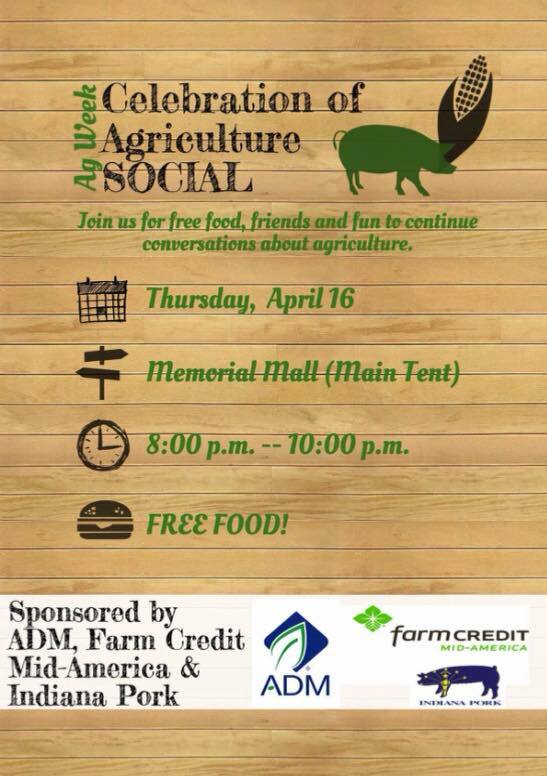 Thursday Instagram Challenge: Take a selfie with a farm animal featured during Ag Week events. Then, post it to your Instagram account along with the hashtags #mAGnifyPurdue and #mAGnifyChallenge and you’ll be entered to win a prize! 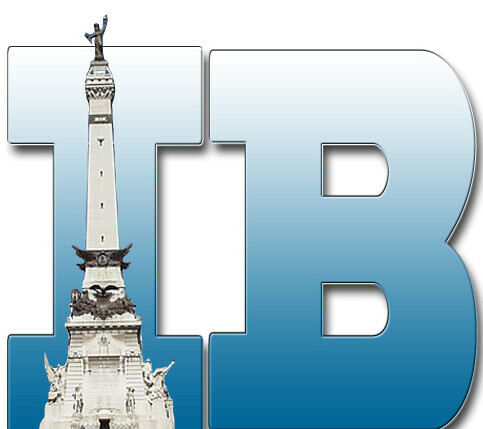 Thursday night will be a Celebration of Agriculture, a social event for the entire Purdue student body, where students can join together in community to continue conversations about agriculture. They will have free pork burgers along with other food, games and music. The goal for this event is to create an opportunity to build a sense of community within the College of Ag and with students from other colleges, too! 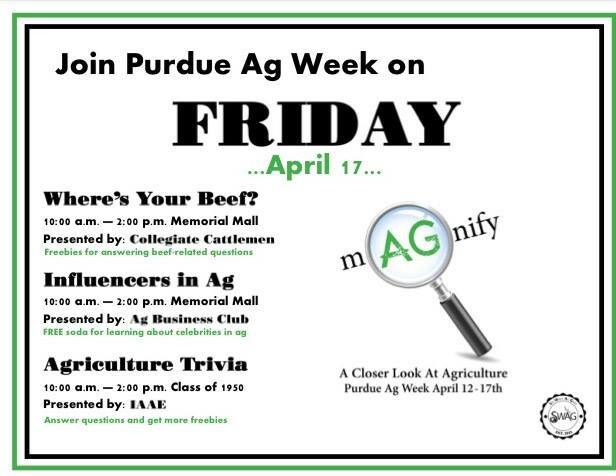 To wrap up the week, there will be three club events on Friday from the Cattleman’s Club, Ag Business Club and IAAE. As well as another daily ag quiz and Instagram challenge! Friday Instagram Challenge: “Favorite Photo Friday” – Post a picture of your favorite Ag Week memory and make sure to include the hashtags #mAGnifyPurdue or #mAGnifyChallenge. 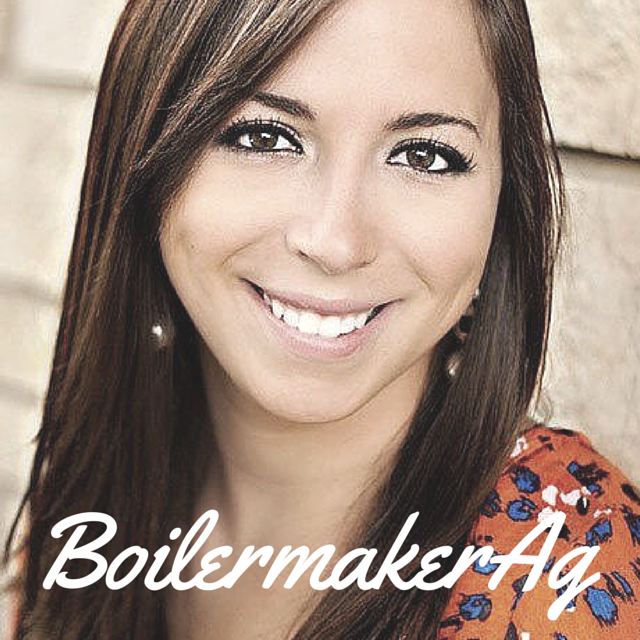 Congrats to all of my fellow Boilermakers on a successful Ag Week!